Description: MIRLC is an ongoing project on providing easy-to-use MIR tools for the live coder. 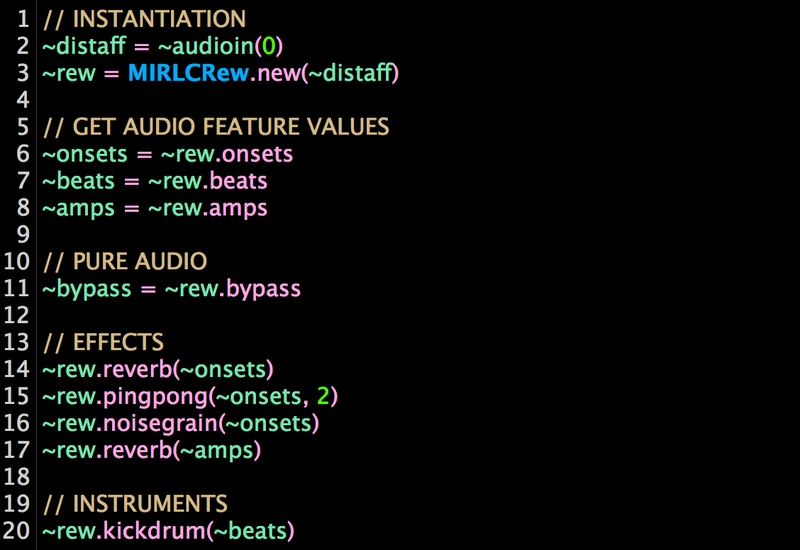 Technologies: SuperCollider, FreeSound.org (sound samples). Live coding @ The RAW and The COOKED, Inter/sections 2018. The Raw, Inter/sections 2018. Café 1001. London, UK. September 28, 2018. Beckon @ NIME 2018. Moss Arts Center: Anne and Ellen Fife Theatre, Blacksburg, VA (USA). June 4, 2018. Beacon @ TEI 2018. Kulturhuset. Stockholm, Sweden. March 20, 2018. Beacon @ NIME 2017. NIME 2017. Stengade. Copenhagen, Denmark. May 16, 2017. Live coding @ Noiselets 2017. Noiselets – a noise music microfestival. Freedonia, Barcelona, Spain. January 8, 2017. Beacon @ Root Signals Festival 2017. Georgia Southern University. Statesboro, Georgia, United States. February 11, 2017. Xambó, A., Roma, G., Lerch, A., Barthet, M., Fakekas, G. (2018) “Live Repurposing of Sounds: MIR Explorations with Personal and Crowdsourced Databases”. In Proceedings of the New Interfaces for Musical Expression (NIME ’18). Blacksburg, Virginia, USA. pp. 364-369. Personal website, blog and portfolio of Anna Xambó.